I realize we are only a week away from Christmas but I just this very moment decided we need something Christmas in this house to make it feel like the holidays! We always wait til Christmas Eve for our tree and the tree is usually our only decoration for the holidays. Our oldest baby is 2 now and she is loving the season so I feel like maybe I should start adding more decorations. I remember my mom telling me that she never decorated for Christmas until my sister and I were 6 and 3 and she only did it because we loved it! Anywho, money is tight this time of year so I am using only what I have in the house. Also, because I tend to change my mind a lot and I am always trying to find my own style I have made these reversible so that in 3 years when I decide red is just not going with the rest of our decor I can switch them to the other side and keep the same stockings! Also, not pictured here is some scrap interfacing I had laying around. If your sweater is really stretchy you may want interfacing so it holds shape! You can use whatever fabric you want but I wanted to avoid a trip to the fabric store (those are not so easy with 2 babies!) so I am using a couple old fat squares and fleece scraps and an old sweater. Yup... I am turning a sweater into a stocking! The sweater shape and size is my biggest limitation for design of the stockings so I started with that and figured out how big I could make my stockings. Also, I wanted two so I was further limited. I started by cutting the belly part of the sweater from the shoulders/neck/sleeves. Because I want two stockings I split the belly part down the middle and then I cut the sleeves off at the shoulders. After I cut the sweater and made my newspaper pattern I cut out the fat squares to the pattern. You can either fold your fabric and put the left of the stocking on the fold and cut or cut out 2 separate pieces, no folding required. Nothing too fancy for the fleece top part, just line it up on the patter and cut it about 1/2in too wide for seam allowances! ﻿﻿﻿ After I had all the pieces cut out I decided to "embroider" (using my quilters foot) my daughters' names to their stockings. For the green side I just wanted it on the fleece top part and for the red side I cut out little fleece hearts to be sewn in the middle of the stocking later on. If you chose to do the standard glue and glitter (my stocking growing up was that way... still looks good after 25 years!) you don't have to do the names right away but because I embroidered and I didn't want a "wrong" side to show I embroidered before assembling the stockings! To quilt/embroider a name (or anything for that matter) I like to use newspaper as a template. The newspaper is especially helpful when using something really stretchy or difficult to freehand on. But if you don't have newspaper or you feel like being brave you can skip the paper! Be sure to practice on some scraps! So first things first, replace your walking foot with the quilters foot and put the guiding teeth down. 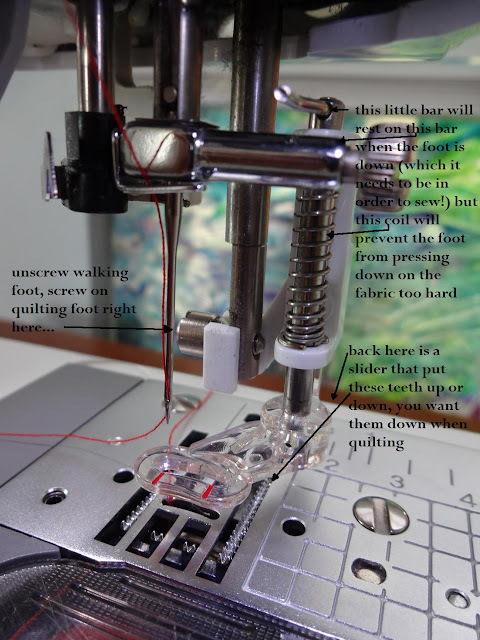 say, "hello" to the quilters foot... don't be scared of the quilters foot! Once your quilters foot is on and you are ready to go, draw on some newspaper whatever you want it to to say or be. I wrote in cursive so I wouldn't need to stop at each letter. But you can just stop and do one letter at a time if you don't want cursive letters. Then pin the newspaper to your fabric. And carefully trace the design! My advice here: set you "cruise control" to medium or high, but move your fabric smoothly and slowly. If you set your cruise control too low it comes out too sloppy. After you sew you pull the newspaper off... it comes right off! and voila... here's a video. Don't mind the toddler chatter in the background! I did a heart with their name for each red stocking and then did the same thing on the fleece strip for the top of the green stocking. Once the names are done you can start assembling the rest of the stockings! The green side is easiest so lets start there. First add the fleece top, put the right sides together and stitch. Flip up the fleece part, fold the right sides together and stitch! Then flip right side out! Now onto the red side... first sew the belly part so its a tube shape do not turn it. Then take the angled end of the sleeve (shoulder) and put it inside the belly part. Line up the angle with the straight of the belly and pin it. Then sew around the belly and sleeve. Then if you need to, add interfacing. I cut out my interfacing using the newspaper template and then sandwiched the sweater into the interfacing and pin. Then you stitch all the way around and turn. I then hand stitched the hearts with names on them to the red part. Flip the red side back to wrong side out and put it inside the green side. Stitch the red and green side together close to the bottom of the fleece and close to the top of the fleece. And then because I change my mind all the time... I decided the red side needed a fleece top too... I made a fleece tube and I hand stitched it (going through the red side only) around the bottom and the top going through both the red and green side. If you want to you can add the hanging part before stitching the two sides together so the ends are hidden but I wanted to add a little decorative button and put the loop on the outside. I just cut a piece of the sweater (its a knit so I didn't have to hem it or anything, it won't fray) and sewed it on by hand with a cute wooden button. That's it! You can really make them any way you want or with an material you want. I still haven't decided which side I like better.